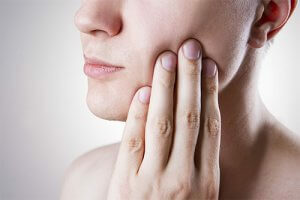 Experiencing Symptoms of Impacted Wisdom Teeth? Are you concerned that your wisdom teeth may be causing health problems? If your wisdom teeth are emerging or if you have postponed their extraction, you will likely experience uncomfortable symptoms like facial pain, toothaches, and headaches. In some cases, wisdom tooth retention may shift teeth to unhealthy positions. They are the last of our teeth to break through the gums. Located farthest back in the mouth, there are four, one on the top and bottom, on each side of the mouth. The arrival of wisdom teeth varies, but generally begin to form in the pre-teen years. By late teen years, the crown of the tooth will begin to erupt through the gums. By mid-twenties, wisdom teeth will either be fully erupted or become impacted. When properly positioned and healthy, they serve as a valuable asset for your mouth, but oftentimes, they will cause a hassle. The symptoms of an impacted wisdom tooth can vary from mild to severe. If you are experiencing issues with your wisdom teeth, contact Prestige Oral Surgery today at 732-297-7000.